The Community Design Workshop (CDW)’s mission is to assist in the rebuilding of Lafayette’s downtown area and its traditional neighborhoods, as well as assisting surrounding small towns and cities throughout the state. It gives our students hands on experience by helping cities, small towns, and neighborhoods visualize their potential as communities. The Coastal Community Resilience Studio addresses the complexities of restoration and preservation along the Louisiana coast. 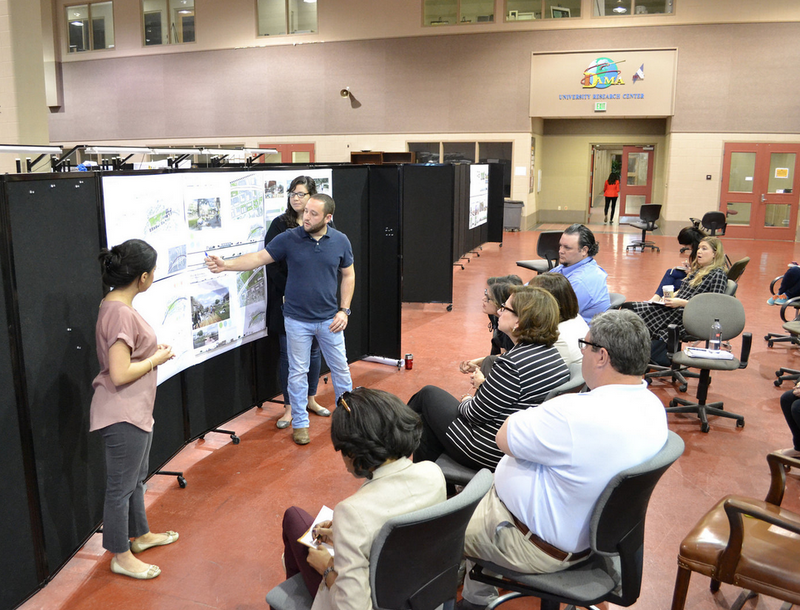 The Resilience Studio is a collaborative effort between researchers, faculty, and students from across the University of Louisiana at Lafayette. The Building Institute (BI) is UL Lafayette’s integrated project delivery, develop-design-build institute. Students design and build projects which range in size from small site installations such as seating and play areas to large scale projects such as pavilions and housing. The Sustainable Development Lab (SDLab) is a research & practice lab that integrates design research and entrepreneurship as a model for market based, design driven economic development that prioritizes individual opportunity along with the public good. The FDMS allows our students to infuse real-life situations into their design projects, such as budgeting and working with vendors. Students conduct extensive interviews with their clients to identify how the space can be used most effectively, and field questions about design elements. You can earn your master’s degree in architecture, even if you do not have an undergraduate degree in architectural studies. Advanced standing may be awarded to candidates who have a degree in a related field. or you have coursework that does not meet the NAAB Student Performance Criteria. Be a part of a forward-thinking and exciting architecture community at UL Lafayette! To earn your master’s degree in architecture from UL Lafayette — if you have an undergraduate degree in a related field — you must complete a minimum of 75 credit hours, which will be determined by the graduate coordinator. After your undergraduate transcript has been evaluated, you’ll work with the graduate coordinator to determine if there is any preparatory or undergraduate coursework you’ll need to take in order to complete your master’s degree in architecture. Our Master of Architecture programs have a thesis option and a non-thesis option, so you can explore the academic and applied areas of architecture. Apply to the Graduate School Today!